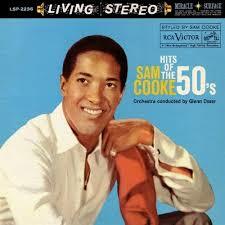 Sam Cooke achieved a bunch of fame and fortune singing boldly about his ignorance of history, biology, and other subjects (“Don’t Know Much About History”). I doubt I’ll get any of those aforementioned benefits, but let me boldly confess yet again that I don’t know much about mathematics. But I am pretty sure that when you are multiplying a string of numbers (without guidance from parentheses), the relative position of the values really doesn’t matter—the result is the same. It’s really important that each and every one of the five elements is present to some degree. After all, if you replace any factor with 0, you get 0. Nada. Nothing. Zilch. On the other hand, Seligman‘s Well-Being Theory does not specify how much of each factor must be present to create the optimal balance for any individual. Defining exactly what constitutes the perfect balance among the elements is deeply personal. 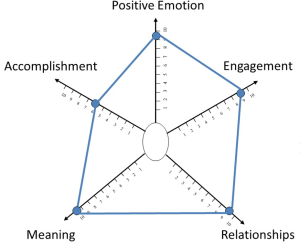 To enjoy a sense of well-being, one individual may value Positive Emotion much more highly than he values Engagement. Another individual may feel a stronger need for Accomplishment than she does for Relationships. And frankly, you may find that the balance across the factors changes over time, as you are shaped by your choices and your life experiences. The balance changes, but the ultimate result—that sense of well-being—is the same. When you are seeking to find or create a Congruent Opportunity, so that you can achieve exponential performance, this question of relative value for the factors of well-being becomes incredibly significant. To illustrate this, let’s return to the thought experiment of visualizing congruence on a graph. We know that 1 x 2 x 2 x 5 x 5=100. 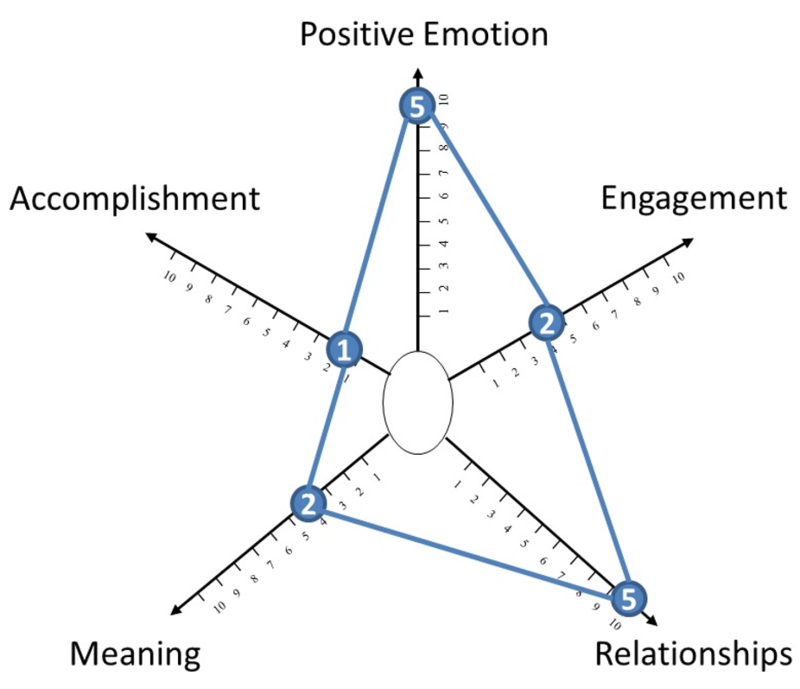 So let’s use those five values in a couple of “thought experiment” graphic examples of how the relative importance of the five elements of well-being define the “shape” to look for when you are considering competing opportunities to determine if they are a good “fit” for you—that is, provide an environment where you have the best theoretical probability of achieving well-being 100% of the time. 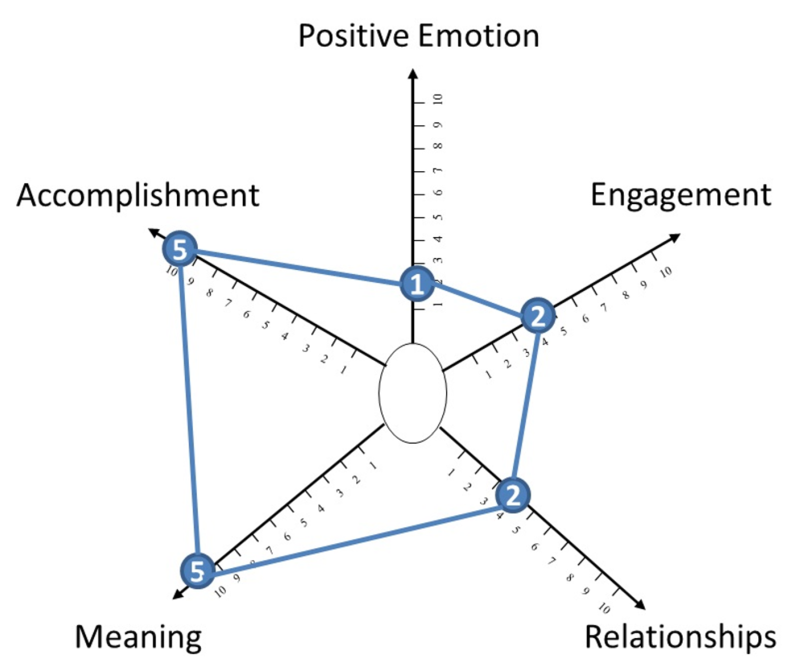 In this first example (left), Positive Emotion and Relationships are the top priorities. Meaning and Engagement are somewhat less important. And Accomplishment is present, but not a primary driver for this individual. 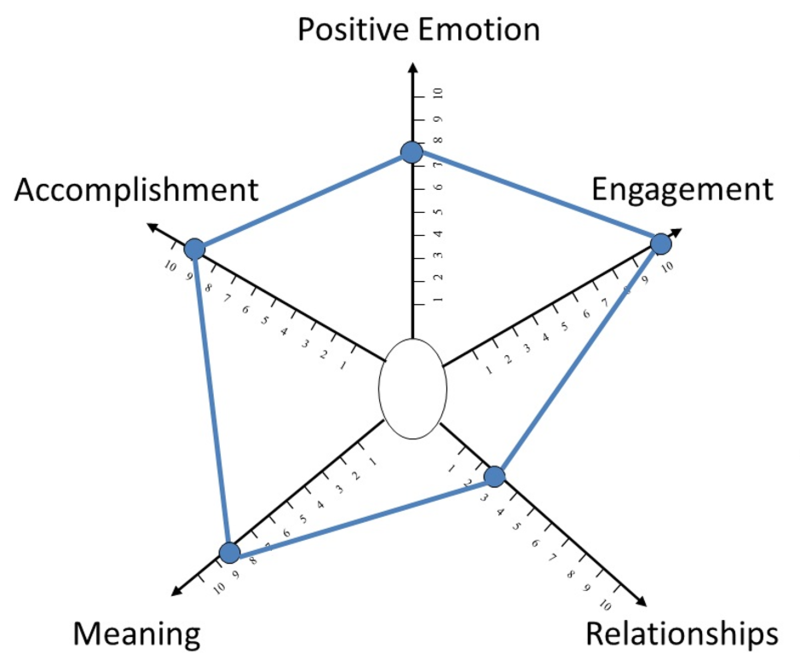 The second example (right) represents someone who is profoundly driven to achieve Accomplishments that have deep personal Meaning, even at the cost of sacrificing Relationships and short-term Positive Emotion. Somewhere around age 9, as Steve was growing up in Indianapolis, he realized that he is a scientist. He experienced his greatest sense of fulfillment when he was exploring ideas, formulating and testing hypotheses, and understanding at a deep level how living organisms actually work. 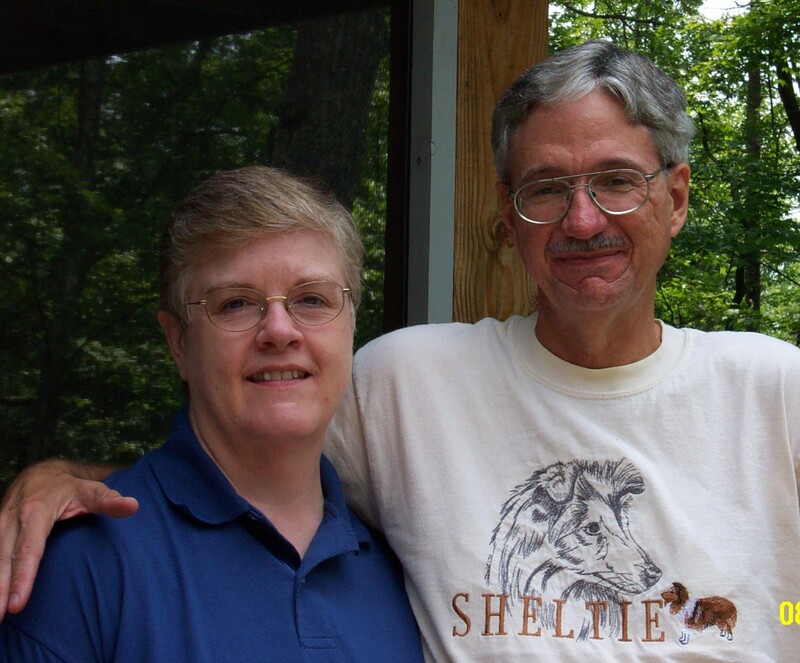 His childhood exploits, such as growing slime mold in the basement, became the basis for his eventual work as a Ph.D. microbiologist investigating the pathogen that causes Whooping Cough (Bordetella pertussis). After 30+ years of marriage, I’ll go out on a limb and chart for you how he would likely balance the five factors of well-being (as shown in the figure on the right). He is driven to deliver significant results in his primary research interest (Accomplishment, Meaning), and loves nothing better than to become completely immersed in a challenging series of experiments at the bench (Engagement). Even the somewhat tedious aspects of research (such as streaking plates, counting colonies, recording data) bring joy to him (Positive Emotion), because it’s all part and parcel of doing good science. Being alone in the lab for hours, even days on end doesn’t bother him in the least. He values Relationships intensely, but his preference is to have only a few of them, and to invest in building them over a long period of time. Steve’s. As you can see on the left, my sense of well-being comes from finding Meaning through my Relationships with people I work with, regardless of job content. I’ve changed careers at least a half-dozen times, and jobs more often than that—the actual content of my work and Accomplishment doesn’t really matter, as long as I’m Engaged, using any of my Talents and creating an up-beat environment for the people around me (Positive Emotion). If you were to parachute Steve and me into a big picnic somewhere, you could probably see our individual searches for congruence playing out pretty clearly. I would approach the event as an opportunity to meet new people, share funny personal stories, and relax into having a rowdy good time. Steve would approach this exact same opportunity as a time to quietly observe interesting organisms interacting from his outpost on the sidelines. Unless he runs into a good friend, he probably won’t engage in a lot of chit-chat. He’d prefer a more in-depth conversation on a topic of significance. Me? I’m swapping one-liners with any and everybody. One opportunity—two different ways to thrive in it. Well-being is in the “I” of the beholder. For you to achieve and sustain exponential performance in work and in life, you must first become aware of your own “shape,” and second, you must consistently take action to find or create opportunities where you can optimize your experience and, in doing so, become self-energizing. Yo u become self-energizing when you work and live in an environment that fosters a virtuous cycle, where things tend to get better and better (the opposite of a vicious cycle, where things tend to get worse and worse). In this environment, the more you are able to flourish personally while achieving high performance in your career, the more motivated you are to invest even more effort, which yields an even greater sense of well-being and accomplishment. Wash, rinse, and repeat, on and on and on. Creating this kind of environment, which you should now recognize as a Congruent Opportunity, requires strong self-awareness and self-management, as already noted. Additionally, it requires mutually beneficial alignment with the other people with whom you share your environment—say, a spouse, a boss, your friends, the people who report to you. A self-energizing individual magnifies his or her satisfaction and capacity by helping those “others” improve their own self-awareness and self-management; that is, by serving as a leader and role model. And at last, we’ve reached a definition for the third level of exponential performance. Anyway…now that you are familiar with the elements of both the original Performance Equation and my equation representing the Theory of Well-Being , this is an opportune time to loop back to the concepts of Opportunity and congruence, and expand our understanding. Sitting there in the Exponential Performance equation, poor old O-for-Opportunity seems pretty plain. Not even an exponent to call its own. But as you will soon see, this humble ring actually encircles quite a critical chunk of territory! In his book, Principles of Self-Management (1999), Dr. John Marshall defines Opportunity simply as being one’s work environment. And in explaining his Performance Equation, he notes that your Talent and Effort are best used, and consistent success is explained by, “being the right person in the right place at the right time.” In this view, then, Opportunity comprises the job and the organizational culture in which you are expected to execute that job. And your career is an isolated subset of your life. Because my quest is to develop a unified theory for helping humans be self-energizing and more fulfilled in work and in life, my view of Opportunity is not bounded by job descriptions, cubical walls, the gang at the office, and the 40-hour workweek (okay, make that 60 hours…80, tops). Today, if you ask many of us if we are engaged in “work” or “life” at any given moment, we’d probably have to say, “I don’t make that sharp distinction.” Just to give one example, today I’m in my home office, doing laundry as a background task, and striving to concentrate on my top priority project (i.e., writing this blog) while being periodically pestered by work-related calls from my business partner, panting and wagging visits from our new puppy, emails from clients, and loud requests from the cat for a two-handed, full-body scratch. Am I living or working? Yes! Even if your work setting is far less permeable than mine, you know that worries about personal issues leach into your thoughts when you are officially “at work.” And the Grump Mode setting from a rough day at the office doesn’t always flip immediately to Cheerful Mode just because you’ve finally escaped to your home and family. Especially when the *%$#@! boss texts you during dinner. In an earlier post, I asserted that you can achieve exponential levels of Performance when you work in a congruent Opportunity—one that aligns with your interests, respects your Attitudes, and rewards you for consistently putting your Talents (both Inherent and Trainable) into Action to the benefit of both you and the organization. This is the first level of exponential performance, focused on performance solely in the context of your work life. 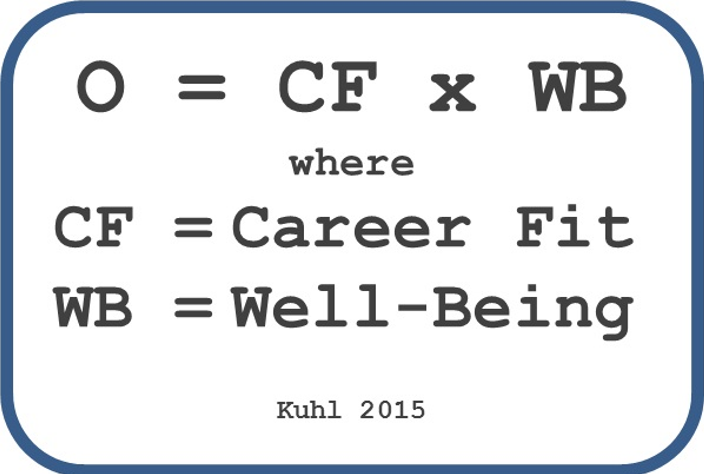 This component of Opportunity is Career Fit, notated in the latest equation as CF. 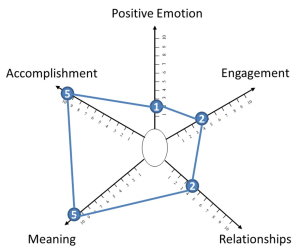 Attaining the second level of exponential performance requires you to expand your understanding of Opportunity—and your search for Congruence—by integrating into them the five elements that make up Well-Being (WB): Positive Emotion, Engagement, Relationships, Meaning, and Accomplishment. This level acknowledges that life and career are inextricably intertwined. Achieving true high performance in one at the cost of completely sacrificing the other isn’t really even possible (not as long as you are pursuing a career, anyway). With this broader understanding in view, here’s my comprehensive definition of the kind of Opportunity that engenders total exponential performance: an environment in which I am rewarded for, and experience Engagement by, investing maximum Effort in using my strongest Talents to achieve Accomplishments that are Meaningful to me while maintaining Relationships that are mutually beneficial and fulfilling, and enjoying the Positive Emotions that result from these activities, interactions, and achievements. Note that all of this applies inside and outside of career context. You achieve true Performance2 only when all of these elements are in optimal balance…as you perceive it. Yes, perception is key, as we’ll explore in the next post. Rather like the character played by John Astin in the Night Gallery episode “Hell’s Bells,” one person’s congruent opportunity could be another person’s worst nightmare! About one hundred and seventy-seven million. That’s the number of hits you’ll find if you go to Google and search for the phrase “work-life balance.” Apparently, there’s a lot to be said on the topic. What’s the optimal balance between work and real life? What does it mean to be a “high performer” in the context of being a fulfilled person, not just a productive employee? The original Performance Equation intentionally addresses performance as it relates to success in specific job roles. You probably know all too well that satisfaction with and in your career affects your sense of well-being in other aspects of life. Being stuck in a job opportunity that is not a natural fit to your talents, energies, attitudes, and beliefs can create chronic crankiness at a minimum, and for some in severe situations, lead to deep depression. However, even for workaholics, life has more to offer than just career satisfaction—factors that can far outweigh the ills of a crappy job. Dr. Martin E. P. Seligman is a psychologist, best-selling author, and one of the founding thinkers behind the relatively new discipline of Positive Psychology. As he explains in his book, Flourish (2011), humans have tended to think about the pursuit of happiness as the path to a good life. But modern-day, first-world thinkers view happiness is a transitory state, a mood often equated with superficial cheerfulness, merriment, and smiles. P is for Positive Emotion. Positive emotions are fleeting responses to changes in the way individuals interpret their current circumstances. When you register that a situation is in some way bad for you, a negative emotion arises; when you sense good fortune, enjoyment, or opportunity, a positive emotion arises. The functions of emotions, both positive and negative, were shaped over millennia by the processes of natural selection to increase an individual’s resources for survival. Dr. Barbara L. Fredrickson has been researching positive emotion for more than 25 years, and is considered a leading scholar in social psychology, affective science, and positive psychology. The list of possible positive emotions is a long one, but in a recent publication (2013), Fredrickson focused on the following 10 positive emotions because they are well-researched and also because they are things we all tend to experience fairly often in our daily lives: joy, gratitude, contentment, interest, hope, pride, amusement, inspiration, awe, and love. Indeed, life would be bleak without these. Next in the formula is E. In this context, E represents Engagement—that sense of being totally absorbed in what you are doing, to the degree that you lose all sense of time, and everything melts away except for your intense focus on the activity at hand. In explaining this factor, Seligman draws heavily on the research and writings of Mihaly Csikszentmihalyi. 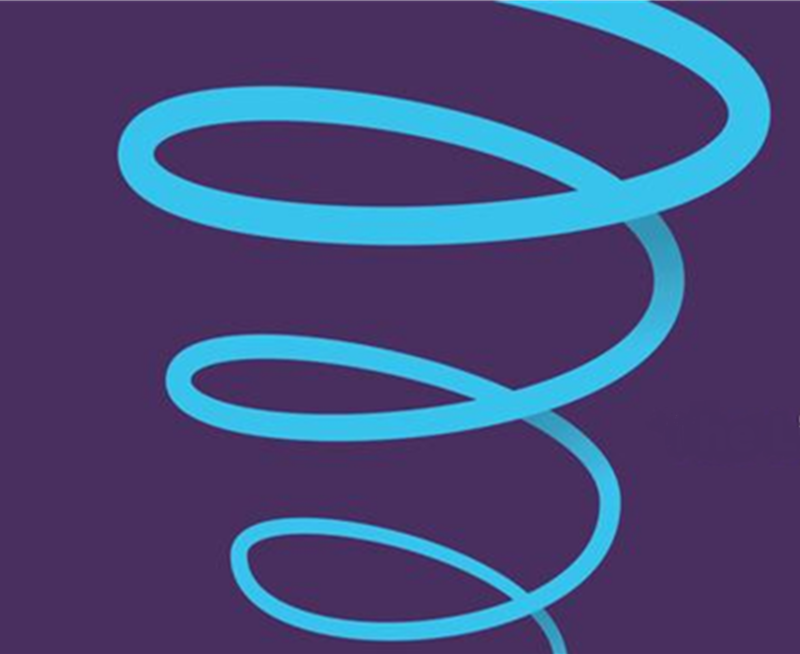 In the business world, Csikszentmihalyi is perhaps best known for his books in the popular press, including Flow: the Psychology of Optimal Experience (1990) and Finding Flow: the Psychology of Engagement with Everyday Life (1997). (Psychology Today magazine offers a nice summary of flow in its online review of Finding Flow.) Individuals can enjoy the enriching benefits of engagement in their vocations, avocations, or ideally, in both. R stands for Relationships. John Donne wasn’t kidding when he said, “No man is an island.” Life on planet Earth inevitably involves interacting with other humans. Put succinctly, this factor reflects the capacity to love and to be loved, and honors the essential role that forming and nurturing positive relationships with others plays in achieving well-being. M equals Meaning. Seligman believes that the “…Meaningful Life consists in belonging to and serving something that you believe is bigger than the self” (2011). Literature from many cultures is littered with archetypal characters who have every material possession and every sensual pleasure imaginable, and yet feel hollow and unfulfilled. The solution? Devoting one’s life to the pursuit of meaningful goals, to making the world a better place, even simply helping another person. A is for Acomplishment. This final factor acknowledges that people are, to varying degrees, hard-wired grow and take action for their benefit in whatever environment they happen to find themselves. We want to accomplish something, although that something differs from person to person, and for any individual, typically changes over time. Well, that’s all fine and lovely, but eagle-eyed readers may see a problem here. The equation for Exponential Performance is notably missing any reference to WB. 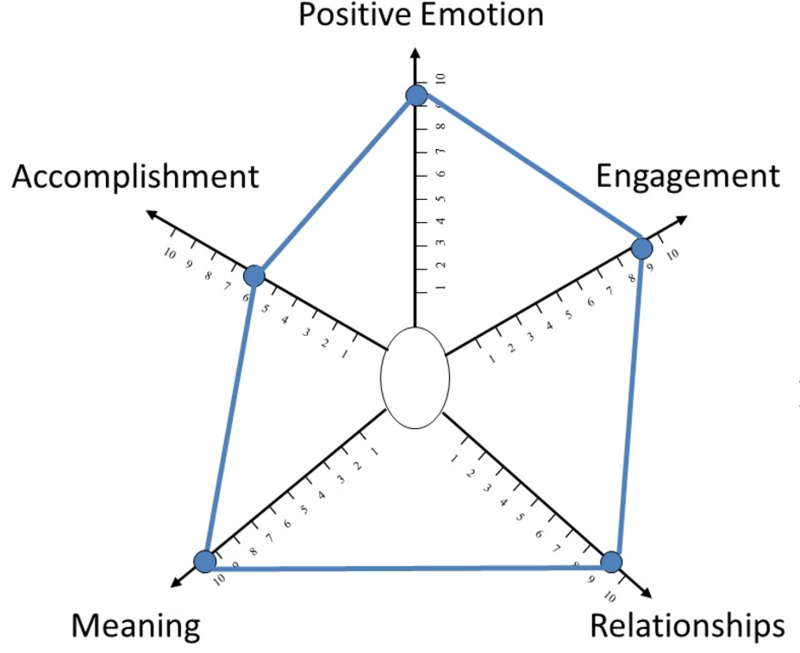 How do the Performance Equation and the Theory of Well-Being mesh into one coherent model? Patience, Grasshopper! Now that we’ve got both models laid out, it’s time to revisit Opportunity and enrich our thinking on that component of the equation. 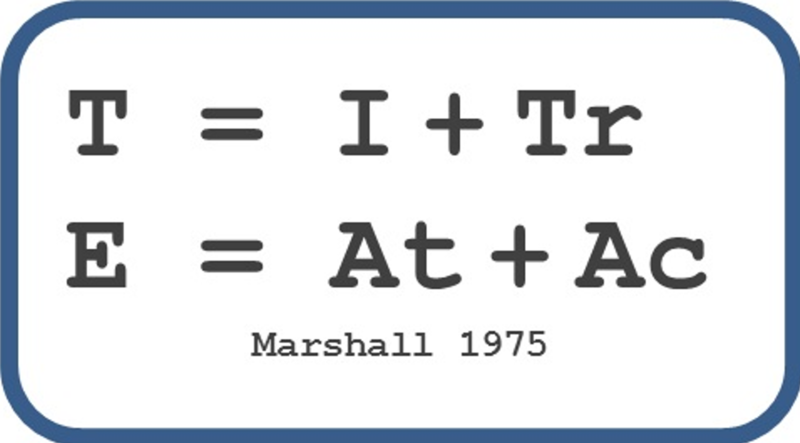 Now that we’ve got the concepts of Talent (T) and Effort (E) squared away, let me take this opportunity to explore the third and final factor in Dr. Marshall’s original Performance Equation. Opportunity (O) refers to the success potential available to you in any given professional environment (Marshall, 1999). As you may recall, in his model, Dr. Marshall asserts that the more closely your talent and effort levels match the known success attributes of a given opportunity, the more likely you are to thrive and flourish there. That is to say, the better your fit with the opportunity, the higher performance level you are predicted to achieve. So what constitutes an opportunity, and how does it limit or enhance your potential for success? 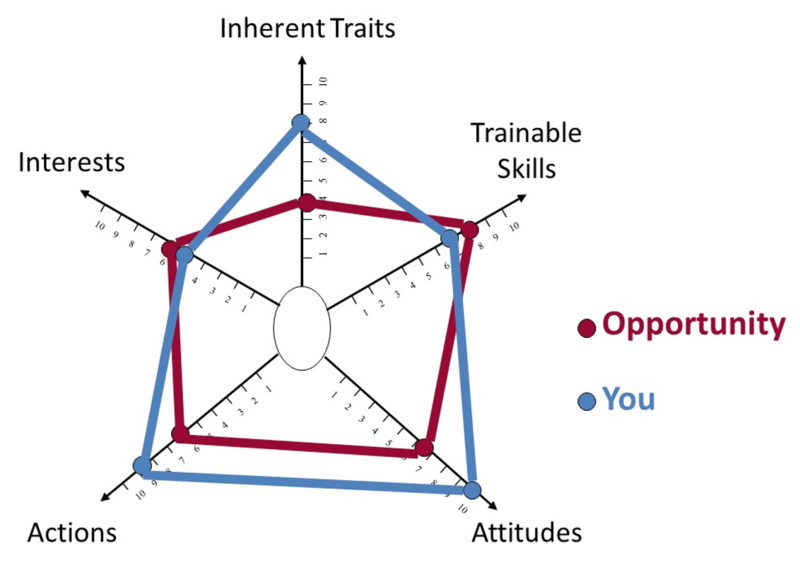 How well does a particular career path or specific job role make use of your inherent strengths? Your current skills, knowledge, and abilities? How well does this opportunity align with your sense of who you are, what you believe in, and what you stand for? 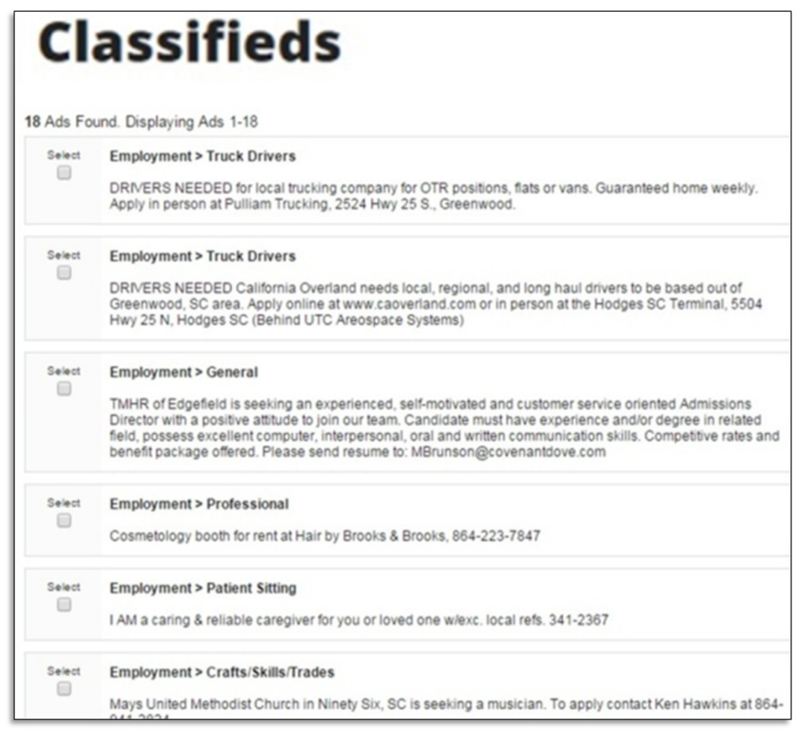 Is this position in a field or industry that interests you? That you believe is valuable to society? Considering the immediate and the long-term results it will generate, is this opportunity worthy of your time, talent, and effort? Are the results meaningful to you? To deliver the results required by the position, what percentage of your effort will be devoted to meaningful work versus effort spent on busy work (as you personally define them)? Would you be likely to feel engaged and challenged while performing the tasks required to achieve the results required by this opportunity? Do the stated values and priorities of this organization’s culture align well with your personal values and priorities? And does the organization actually put its values into practice? Does the organization’s culture promote the levels of personal and professional growth that you seek? Will you be rewarded for your work in a way that is meaningful to you? Would you enjoy working in this environment, including the facility, the people, the energy level? Does the culture promote positive relationships among colleagues? Are your personal style, sense of humor, and personality quirks likely to be well-received? Does the culture promote work/life balance? Clearly, the answers to these questions are unique and highly personalized. I believe it’s also pretty clear how putting yourself into an opportunity that is not a good fit could be career-limiting at best, and totally demoralizing at worst. To take just one example, you would be hard-pressed to feel energized and to consistently perform at your highest and best level if you were stuck in a role that felt like it was 90% busy work and only 10% productive time. Why, it would be like being a square peg in a round hole! Which brings me to Euclid. Do you remember Euclidean Geometry? It seems to me that I first encountered the joys of Euclidean Geometry fairly early in high school. I loved it! Messing around with dots, lines, angles, and polygons was much cooler than messing around with numbers and solving for x. 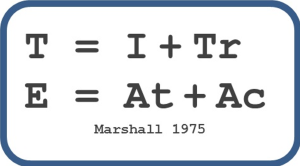 Thinking through Marshall’s concept of individual “fit” to an Opportunity being essential to Performance, I have an image from high school math class of trying to align one multi-sided shape with another multi-sided shape. And if they line up, they are said to be congruent. This concept of congruence strikes me as an elegant way to visualize how Talent and Effort do or don’t line up with any given Opportunity. In the spirit of Einstein, let’s perform a thought experiment. Imagine that you could indicate a point on each respective axis to represent the Talent, Effort, and Interests requirements of the job. 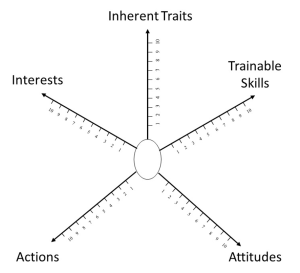 Imagine also that you could map on those same axes points representing your Talents, Effort, and Interests. You could then compare the shapes to determine whether you were naturally suited to be a high performer in that role. Are they congruent? 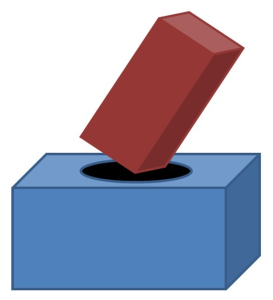 Or is it a square peg/round hole situation? Using this image, it becomes pretty easy to see for which Opportunity your Talent and Effort are a good fit. Let’s look at a couple of examples. 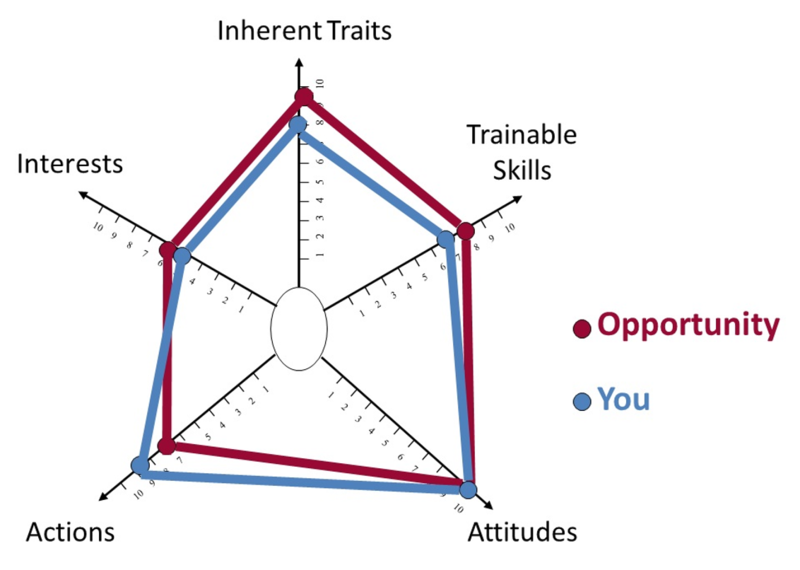 Note that in the diagrams, the red shape represents the requirements of the Opportunity, and the blue shape represents the shape of your natural strengths. In the first example, compared to the job requirements, your inherent traits are way out of whack—it appears that some of your inherent strengths would not be well used, although your trainable skills, knowledge, and abilities are pretty close to the requirement. Also, both aspects of your Effort exceed the position’s needs. In contrast, consider the second example. Same you-shape, different opportunity. In this case, it appears that what you have and what the Opportunity requires are pretty close to being congruent. The Performance Equation predicts that you are much more likely to be a high performer in the second opportunity. 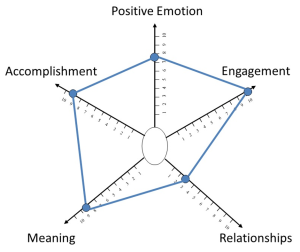 To express all this in plain English, rather than plane Geometry, you can achieve exponential levels of Performance when you work in a congruent Opportunity—one that aligns with your interests, respects your Attitudes, and rewards you for consistently putting your Talents (both Inherent and Trainable) into Action to the benefit of both you and the organization. Talent squared times Effort squared while working in a congruent Opportunity yields Performance squared. Yeah, I figured you’d notice that. And obviously, it’s a pretty significant question. In Dr. Marshall’s initial research, Performance was measured purely in terms of net earnings in the context of a competitive sales environment—whoever bagged the most bucks was the high performer. In thousands of validation studies across 35 years and numerous industries, the understanding of Performance has broadened. For our purposes, a high performer is someone who consistently meets and exceeds the defined results required by a particular job role. 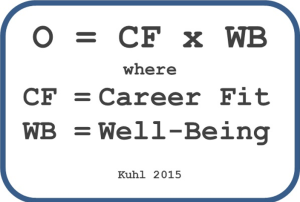 Remember, the original Performance Equation addresses performance and retention relative to one’s work life. But wait—there’s more to life than just work! What does it mean to be a “high performer” when it comes to leading a good, fulfilling life? Excellent question. Remember, my quest is to bring together current research in neuroscience, psychology, psychometrics, and predictive analytics to form a unified theory for how humans can be more effective and more fulfilled in work and in life. So now it’s time to explore Model #2. Having a great attitude is a great start, but real value in life and work comes from translating that attitude into meaningful action. That’s the difference between having great potential versus delivering great performance. And achieving exponentially great performance is our aim, after all. What do we mean by habits of thought? Imagine yourself diligently making your way through a typical day. As usual, stuff happens (to paraphrase a popular bumper sticker), and each time, you have the mental equivalent of a knee-jerk reaction in which you explain yourself to yourself. As you can see, the Attitude you express in the way you explain yourself to yourself has a huge impact on the Actions that you actually will do—your habits of behavior. If you believe you can learn from mistakes, you’ll make a mental note to dry off wet glassware before moving it. 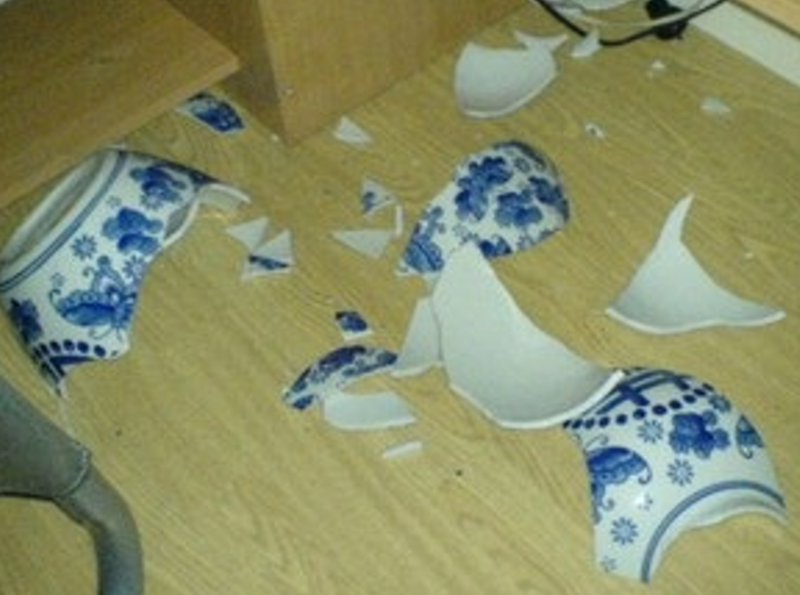 But if you believe you’re just a klutz, well…too bad, nothing you can do. If you believe that your networking led to snagging a good prospect, you’ll redouble your efforts. But if it was just dumb luck, well…let’s keep our fingers crossed that it happens again. If you think that an old dog like you can learn new tricks, you’ll seek out opportunities to master new skills, knowledge, and abilities. But if you don’t, well…just avoid taking any chances or trying anything challenging. To make things even more interesting, when you start talking about habits of thought and their impact on your habits of behavior, you encounter what is sometimes called the problem of “one brain, two minds.” Biologically, humans obviously have one brain, but when it comes to decision-making—such as deciding what actions to take—the brain has two distinctly different systems in play: the rational system, and the emotional system. Each system has different strengths and weaknesses, and both are crucial to survival and success. Author and psychologist Jonathan Haidt presents a wonderfully helpful analogy in his book, The Happiness Hypothesis, and the Heath brothers (Chip and Dan) popularized it further in their book, Switch: How to Change Things When Change is Hard. Put succinctly, imagine that your brain is a Rider sitting high atop an Elephant. 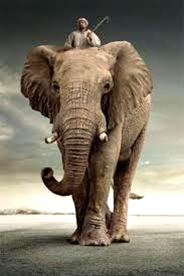 The Rider represents the rational systems; the Elephant, the emotional systems. They have to work together to get anywhere. This rational system/emotional system concept is a massive topic, and we’ll be coming back to it frequently and in greater detail as we go along. Until then, you might enjoy this 2-minute video, “The Rider, The Elephant, and The Path.” And keep in mind that when we talk about improving performance and increasing well-being, the implication is that we are changing from a current state to a desired future state. As my friend and colleague Sam Yankelevitch would say, “This is just the tip of the tip of the iceberg!” As our journey to exponential performance continues, we’ll invest significant effort in understanding Effort. Recent research in neuroscience and psychology offers staggering amounts of information about the interactions of Attitude and Action! But for now, let’s return to the task of defining exponential performance. You raise the power of your Effort when you consciously optimize your habits of thought (a.k.a. 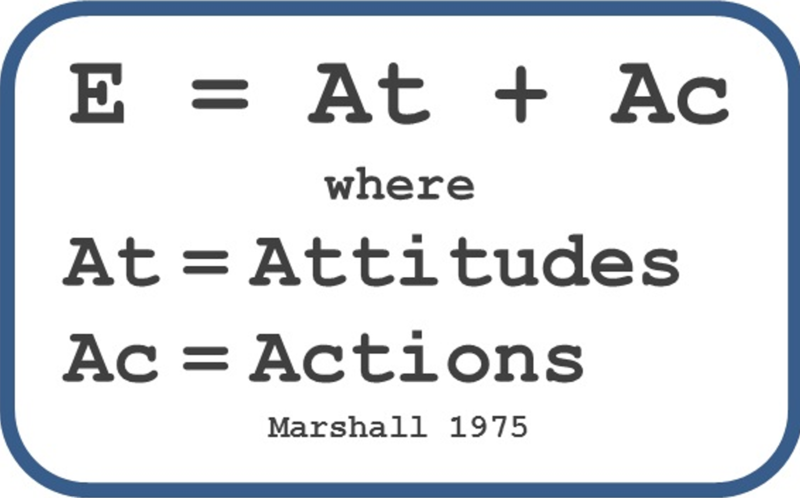 attitude—At) by aligning the rational systems with the emotional systems, and then use those habits of thought to drive your habits of action (Ac) in ways that move you toward your goals. My next action? Create a post addressing the third element of the Performance Equation: Opportunity. What is it? And is it knocking? In casual conversation, when we talk about talent, we typically mean natural, “in-born” gifts, such as quick wit or outgoing personality, or special aptitudes, such as being good with numbers or sports or music. For purposes of understanding the Performance Equation, we’re taking a slightly more formal approach to defining Talent. In this context, Talent is made up of two components: Inherent Traits and Trainable Skills, Knowledge, and Abilities. 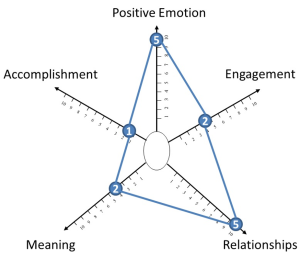 In the previous post, we discussed how Dr. John C. Marshall and his research team came to identify the six personality traits that have now been statistically demonstrated to predict high performance and retention in business roles. As you recall, these six traits are essentially “hard-wired” into your personality by the time you reach early adulthood. 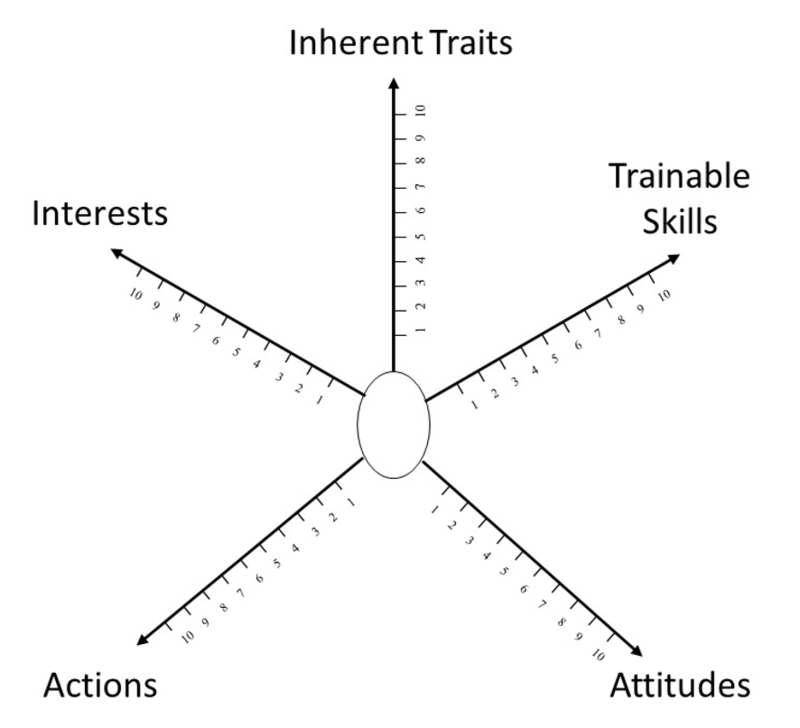 These are the Inherent Traits in this model. So what, then, are the trainable skills? With apologies to public radio host Michael Feldman, trainable skills, knowledge, and abilities are the answer to the question, “Whaddaya know?” They are the other half of the can do concept. The great thing about your skills, knowledge, and ability is that you can always, at any point during your life, learn new stuff! In fact, you are typically learning new stuff all the time. In my updated equation for exponential performance, your Talent can be more than just the sum of your Inherent Traits and your Trainable Skills. 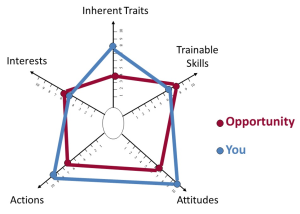 You significantly enhance the value of your Talents when you consciously align your Trainable Skill choices with your unique Inherent Traits. 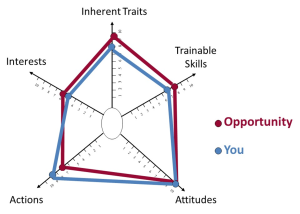 Or, to express this concept as a formula (see blue box), Talent increases exponentially (T2) when you multiply your Inherent strengths (I) by acquiring skills, knowledge, and abilities (Tr) that build on those strengths. To take a simplistic example, consider your personal comfort zone around conflict. If you are inherently comfortable with conflict, you might readily build on that strength by joining a debate team or taking a class in negotiating skills. If, however, you prefer to avoid conflict, you would be at a bit of a disadvantage, needing first to overcome your general reluctance to engage before being able make the most of the new learning. Well-known management guru Peter F. Drucker was getting at this same idea when he said, “It takes far more energy to improve from incompetence to mediocrity than to improve from first-rate performance to excellence.” (1999) In a nutshell—build on your strengths. Why waste effort on weaknesses? And speaking of effort…having traversed the trail to exponential Talent, it’s time to take the exit toward exponential Effort in the next post. Exponential Performance Defined—What’s Hockey Got to Do with It? I’m a word-weenie, not a number-cruncher. Venturing into territory that even pretends to involve mathematics is risky for me. 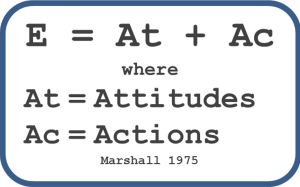 Even so, my experience with applying the Performance Equation both personally and in selecting and developing high performers has led me to an insight that I believe makes sense metaphorically, if not mathematically, when expressed as a formula. Before leaping to my conclusion about exponential performance, we must first dig more deeply into the reasoning and research that form the underpinning for the original Performance Equation: T x E x O = P.
We’ll focus first on the T—Talent—and its two components, Inherent Traits (I) and Trainable Skills (Tr). Still, all that hard work paid off. John made it to the NHL. He played with the Philadelphia Flyers organization in 1967-8, and then coached hockey at York University and in Italy. 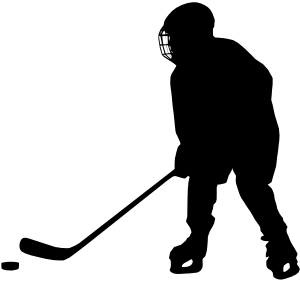 “I could see in pro-[hockey] camp that some very skilled players never made it to the top, and others that were not quite as skilled (but still relatively skilled) were very, very successful. And of course, the ones at the top were very skilled and they worked very hard. Talent and effort. John recognized from his own life experience that his intense effort allowed him to perform better than his inherent talent would suggest that he could—to punch above his weight, to mix sports metaphors. The interaction between these two aspects of performance deeply fascinated John, and ultimately led him to leave hockey and pursue a Ph.D. at York University. 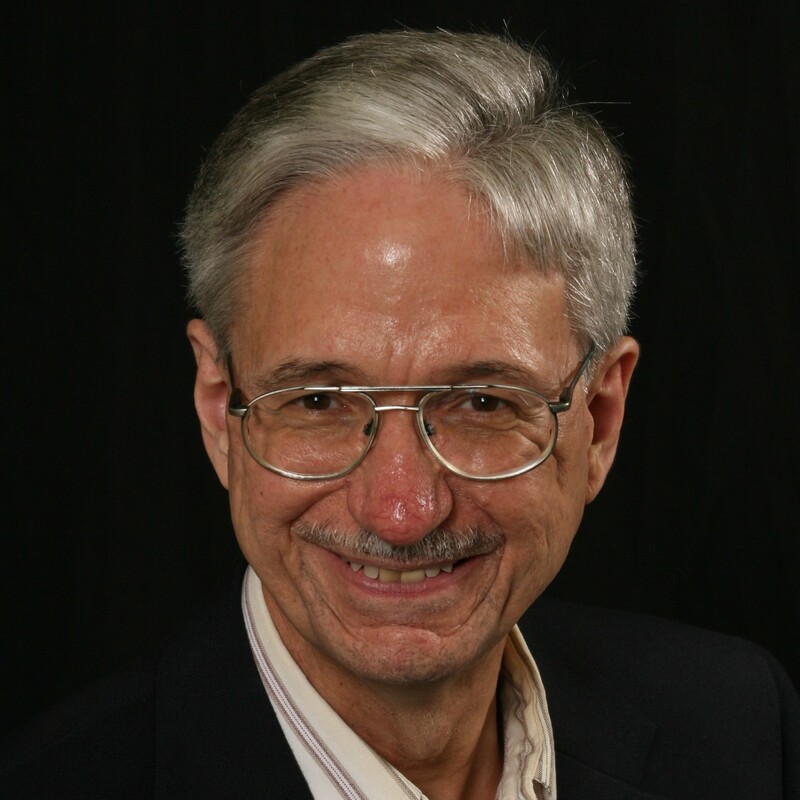 John’s doctoral thesis was an exploration of the effects and influences of competitive environments. His original theory was that high-demand work environments (such as professional hockey or competitive sales) require powerful personality characteristics for someone to survive and perform effectively. The further hypothesis was that these characteristics could be assessed reliably and that all individuals possess these characteristics to varying degrees (Marshall, 2003). 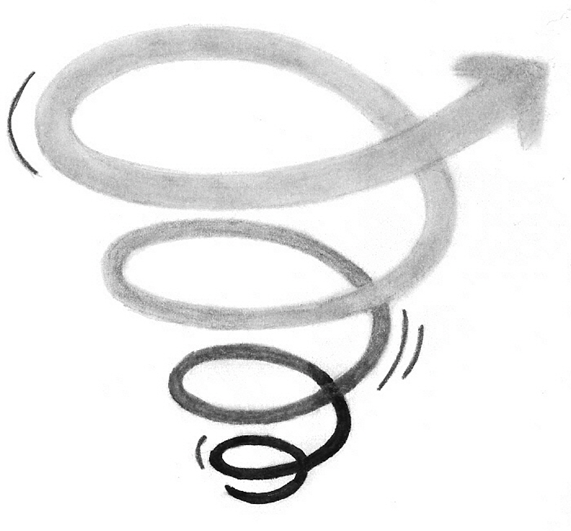 After analyzing the best psychological thinking of the times, John targeted a short list of personality characteristics that he believed would be performance differentiators, and envisioned them as bi-polar continua stretching from one extreme to another. The original study involved 87 competitive salesmen in the real estate, life insurance, and automotive sectors, and used their net income as the “score” that separated high performers from low performers. Lo and behold, the research validated John’s hypotheses, and our friend the hard-working hockey player became John C. Marshall, Ph.D., founder of Self Management Group, the first and largest online assess ment company in the world. 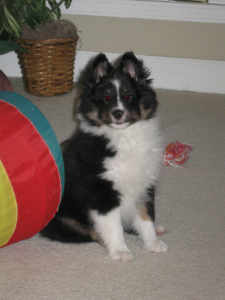 Achievement Potential—what motivates you: $$/challenge? 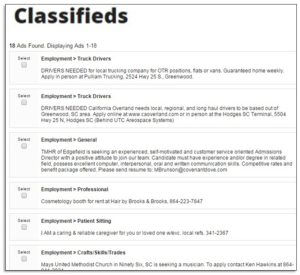 People & service? Duty? Psychologists have long understood that these inherent traits, the core elements of our personalities, are established early in life, and don’t readily change. Indeed, Enterprising Potential, Achievement Potential, and Independence Potential are generally well-established in an individual by the time they reach age 16. The remaining three traits—Comfort with Conflict, People Orientation, and Analytical Orientation—congeal a little later, after one has had more experience working with people and information. Still, by your late 20s/early 30s, these traits are also pretty well baked into your personality. Looping back now (whew—finally!) to the Performance Equation, you can see that in terms of what you can do (aka your Talent), your inherent personality traits make a crucial contribution. But they provide only part of the picture. As Paul Harvey used to say, in the next post, we’ll look at “the rest of the story” regarding Talent. Full Disclosure: I am a Senior Consultant with Smart Work | Network, Inc., the master U.S. distributor of Self Management Group assessment products, and my company, V&R Consulting, LLC, is a reseller of those products.